Since its much-publicized launch in 2005, Nicholas Negroponte’s One Laptop Per Child (OLPC) program has been both lauded and criticized. 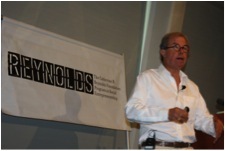 I recently had the opportunity to hear Negroponte at the NYU Reynolds Speaker Series, hosted by New York University’s Reynolds Fellowship for Social Entrepreneurs. After addressing a packed room, Negroponte sat down for a more informal and personal exchange with Reynolds Fellows and Scholars, (a disclaimer, I am an Alumna of the program) to discuss his take on OLPC’s journey to-date, future endeavors, his frustrations and responses to critics. More than half a decade since its launch, OLPC holds some valuable insights and lessons for those of us working at the nexus of mission, versus profit driven. To be sure, there are well worn themes to this story. For instance, lessons abound about the promise and perils of publicity. OLPC was one of the best publicized development initiatives in recent memory, creating a “nowhere-to-fall but short” scenario on many fronts. To add to the buzz, it was well capitalized early, with grant funding to be drawn down, as opposed to the experience of the typical shoestring not-for-profit, or BoP social enterprise. It garnered the most publicity for playing in the big leagues with commercial powerhouses like Intel and Microsoft. “Commercial interests were constantly thwarting us. We don’t use Windows. We don’t use Intel processors. We are open source,” says Negroponte. The ensuing “Laptop Wars” were covered widely, including here. Rather than rehash these themes, this is hopefully a moment in OLPC’s evolution to shed light on what its experience underscores for the larger BoP context. First though, some of the highlights of Negroponte’s comments. (Left: Negroponte addressing the crowd at NYU Reynolds Speaker Series. Image credit: NYU Reynolds). Criticism of the OLPC initiative runs the spectrum – from the valid, (for instance, why have sales fallen so far below target?) – to the largely existential and rhetorical (why laptops and not more vital goods and services?). On sales targets, Negroponte grants that OLPC’s evolution has been an iterative process, quite different from what was projected at launch. According to Negroponte, OLPC has distributed 2.5 million laptops to date. The initial projections were 150 million laptops by the end of 2008. Negroponte concedes that OLPC has faced significant challenges converting lip service and verbal commitments from heads of state into actual sales and distribution of laptops at scale. It appears that in large part, this had to with players like Intel fiercely competing for marketshare with more compelling value propositions to governments, backed by greater and demonstrated staying power. Another valid point of criticism: why call it the US $100 laptop, when it never was? Negroponte concedes they were off the mark – the laptop currently costs roughly $175-$185 per unit. However, he also points out that criticism based on this pricing misnomer rarely takes into account the declining dollar. If the terms of reference were a more stable currency, Negroponte states that OLPC’s progress over the last five years could be likened to delivering what is effectively a 100 Swiss Franc laptop, down from roughly 300 Swiss Francs when initially introduced. Negroponte is steadfast in defending against criticisms about the efficacy of the OLPC initiative and slots these critiques in one of two camps; those that view laptops as an accessory and not vital to development efforts, and a second related position that argues the opportunity cost of OLPC’s endeavors. As OLPC has drawn down a massive capital injection of roughly US $35 million, the jury is perpetually out on how these funds could have been better mobilized and deployed. Negroponte’s response to the question of “Why not healthcare, clean water, housing or education?” is to posit that “laptops” and “education” are interchangeable in such a question. “They are not synonymous,” he concedes, but he maintains that the degree to which laptops contribute to education, and how the two can increasingly become synonymous in an ever-more connected world is a more useful and interesting conversation to engage in than existential arguments about opportunity cost. As of mid 2011, plans are under way to split OLPC into two entities, and in the mix is a new for-profit company. In hopes of competing on a more one-to-one basis with competitors, and to raise capital under a business structure, the newly minted OLPC Association will handle the business operations of the organization including manufacturing, sales and distribution of laptops and tablets. The OLPC Foundation, still headed by Negroponte, will manage technology development in line with the mission of the organization, continuing on as a non-profit. This duality under one umbrella will be something to observe. Where the past witnessed the mission-driven OLPC against external commercial interests, it would seem that OLPC is setting itself up to internalize some of these same tensions. 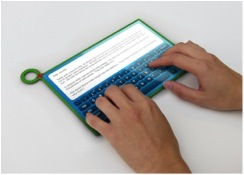 (Above: OLPC’s next model, a tablet equipped with a solar panel/battery cover. Image credit: OLPC). What is Next for OLPC? Negroponte told us about the newest initiative of OLPC, a literacy endeavor focused on the question: “Can children learn to read on their own?” Based on the observation that children recognize words in a storybook as it is read to them down to the page break, OLPC is attempting to push the envelope on whether technology can teach a child to read. OLPC tablets – and Negroponte seemed open to other interfaces in the future such as smartphones – will provide access to thousands of children’s stories and will effectively read to the child as the words illuminate. It appears a more pronounced step into the realm of content development than OLPC has previously undertaken. Negroponte views this endeavor is an experiment in whether technology can jump-start reading and literacy for children in areas of scarce resources, where qualified teachers in particular are lacking. (The low-cost tablet market could be getting more competition if India follows through on plans for a $45 tablet). What Can We Learn from OLPC? The Reynolds Speaker Series, and particularly the conversation following was a rare opportunity to have a candid conversation with a battle-tested social entrepreneur and a chance to consider some of the larger lessons that OLPC offers. Apart from the usual criticisms and themes above, I find several salient lessons from the half-decade journey that has been OLPC. The first is that non-profits can make a market. OLPC is a rare example of a not-for-profit development initiative that was “market making”- a moniker usually reserved for powerful commercial players willing to take risks, innovate and be the moving target that others seek to copy or best. OLPC created buzz, laid a foundation and (albeit unwittingly) seeded a desirable field for an influx of competitors willing to serve low-income markets. All this rush to produce inexpensive and durable computers resulted in innovation blowback effects unlike anything witnessed over the same period. OLPC hype, and ensuing competition bolstered a new market for netbooks, now rapidly gaining marketshare in higher income segments around the world. If making a market were the mission of OLPC, then Mission Accomplished – or so it would seem. Ultimately, OLPC did not have the capital, power or prowess in innovation to stay ahead of the curve for very long. It created a market that ended up cannibalizing it. But net-net, more computing solutions — netbooks, Classmate PCs, and a host of other competitors – are in, or will reach, low-income communities quicker than without the OLPC campaign. It’s not clearly evident what OLPC’s total social value created has been. What is clearly evident, based on OLPC’s experience, is that market forces are not all –and in some cases not at all–beneficial to fledgling BoP initiatives. The OLPC story seems to underscore that if you are one of the rare mission-driven initiatives that makes a market, you will quickly need to adapt and innovate your own role. Its experience proves that even with huge grant-based capital commitments, there is a league in which mission-driven ventures are hard pressed to play. Staying relevant requires innovating, and perhaps not along the lines that secured your initial success. Large scale production, technology innovation, and economies of scale-reliant efficiencies and processes are not usually long-term fortes for mission-driven organizations. On the other hand, social enterprises and mission-driven organizations often have a competitive advantage in the creation of content, innovations in last-mile delivery, capacity building, and tapping into latent resources of client communities. OLPC’s mission has always been to “empower the world’s poorest children through education.” As I see it, the task at hand for OLPC is to innovate how it advances the mission of education through technology, by doing what other commercial players won’t try – for instance, alternative distribution channels (other than governments), working with other large scale non-profits and venturing into multi-product bundling on various interfaces. As opposed to hardware or software innovation, OLPC’s real challenge is to innovate its missionware. If it seizes this opportunity it can still set the stage for what education through technology looks like by advancing out-of-the-box ways to get educational offerings (technology bundled with content) in the hands of children. The reading program outlined above might be just the way to start. Ultimately, OLPC is a hugely relevant initiative and experience, for the lessons offered, for galvanizing the attention of large players, for bringing the costs of computers down and for accelerating the pace at which technology reaches the poorest. Let us know your thoughts.